My son is now three and a half and is the only one of his friends not to have a play kitchen. It was something I thought about buying in the past and then as time went by I thought he might be about to outgrow having one. However, at every play date or when I pick him up from nursery this seems to be the most loved and played with toy. My youngest is also getting to the age where he wants to join in so this Christmas Santa was kind enough to bring a play kitchen down the chimney. The are numerous play kitchens on the market but the thought of another large piece of gaudy plastic in my house was too much to bare. Cost was also another key consideration. 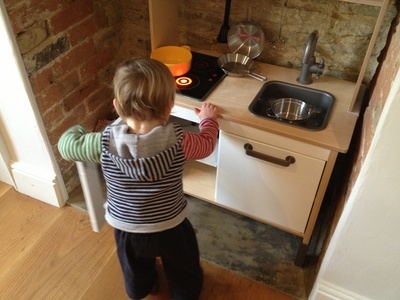 After a little research, we purchased the Duktig play kitchen from IKEA, both the main section and optional extra top section. Simple, classic look in neutral colours. It's sturdy and feels like it will be able to handle two boys but time will tell. A good height and size. Two children can comfortably play side by side and it's tall enough for growing kids. 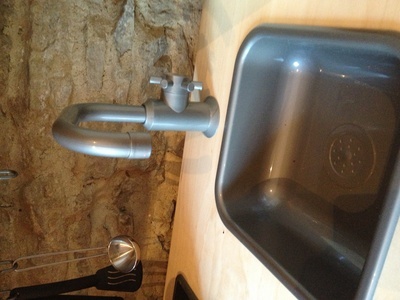 I like the idea of a sink to teach them about washing up. 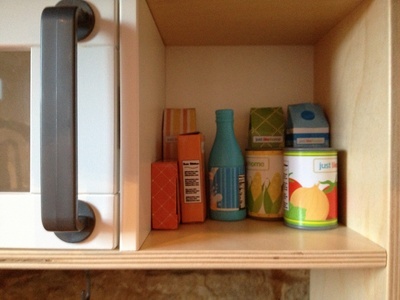 Cupboards that open and close mean my kitchen cupboards aren't being ransacked as frequently. 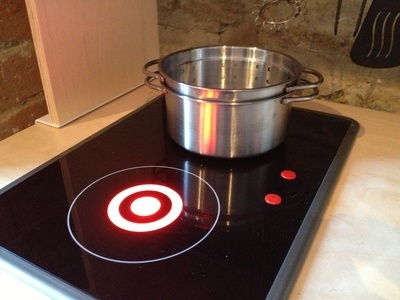 Press a simple button and the cooker hob glows. My kids love buttons and lights. Finally the price is reasonable especially when given as a joint present between two brothers. To be honest, so far there have been very few drawbacks. Being IKEA, you need to assemble yourself. My husband is well practised in IKEA furniture but it still took him an hour to put together on Christmas Eve. While I like the neutral colours, it's not so exciting for kids. 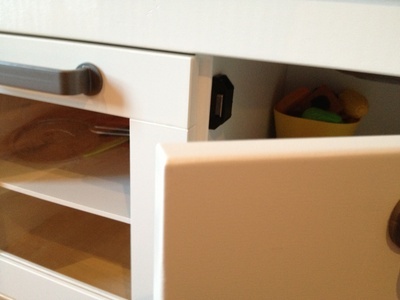 However you could have fun customising your kitchen. The top section could potentially make it a bit heavy and possible to tumble. The kitchen comes with a strap to it can be secured to a wall for safety but this makes it a little less flexible for moving about. 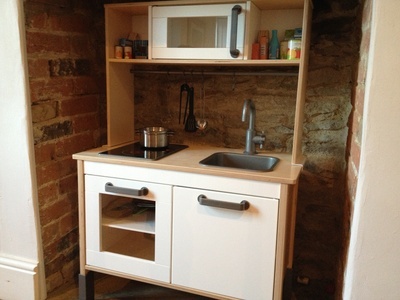 This play kitchen looks great Claire. It's very realistic and most of the plastic ones look really girly. Nice choice.